Heidelberg: a world-famous city and perennial tourist favorite which even Goethe felt had something "quite ideal". It is the blend of different, thoroughly contrasting characteristics that harmonize to make Heidelberg a fascinating and unique place. The charm of this interplay has inspired artists, stimulated scientists and is an unforgettable experience for all visitors to the city. Not only is Heidelberg home to the oldest university in Germany, the world-famous Castle, the Old Bridge and historic lanes like the Philosopher’s Walk. It is also worth visiting for its cultural scene. The museums offer a multitude of outstanding art and cultural treasures. Internationally renowned artists perform at annual festivals. 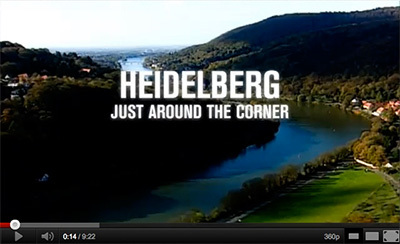 Do not miss out on the wonderful landscape surrounding Heidelberg. Take a boat trip on the Neckar river, e.g., or go on an excursion to the Königsstuhl hill. For traveling information and an extract from the city map of Heidelberg, please click here.